It was more than a month ago when I received a package from the owner of Crumbs and Grubs, mommy Jeanne Marfal. No, I'm not feeding my 4-year-old Little Bebeng through my breast, but I just wanted to try their products & she sent me the cookies. I might not get the best of the other products (brownies & other breads from its sister company) if it will be shipped to me so she advised me to meet her instead. We have already scheduled a meet-up but we both got busy with some personal things that it ended up her shipping a pack of cookies to me. That was a little after I had my dramatic ectopic pregnancy. I first met Crumbs & Grubs through its sister, Crazy Bakes. I followed it in Twitter, sent a DM & the love story goes. When I had the pack of cookies which was individually-wrapped (good thing kasi hindi kukunat yung iba if you don't want to eat pa), I opened one immediately. I took a bite & tasted a bit of cinnamon, I guess. Gumana ang pagiging feeling foodie ko. I liked the taste of cinnamon in cookies, fyi. Ang lakas maka-soshal. I'm not just sure if there's cinnamon nga. Hehe. But my friend Mescy, a fellow army wife, who visited me didn't like the taste of what-seemed-to-be-a-cinnamon in it. She was not breastfeeding her 1-year-old boy anymore so she was adamant to taste it pa nga. Grabe, para kaming mga adventurous teenagers who were trying out a happy brownie. Haha! Naubos naman namin yung isang cookie. I paired it up with a cup of coffee, siya water lang. Yun pala, a little after she had her vacation here in Manila (where they spent her son's 1st birthday; she lives in CDO City), her numerous pregnancy tests gave her two lines! It is yet to be confirmed by a trans-vaginal ultrasound (TVU) though but she claims she is. Iba ang kutob ng isang mudrabelle. I thought pa nga, hindi kaya nakatulong ang lactation cookies from Crumbs & Grubs in her conception? Charot. Few weeks after that, since I planned to share my cookie blessings to those who really need it, I gave 2 cookies to my cousin of Lollies & Lipsticks. She said that it's really going to help her because she's bf-ing her 2-month-old baby girl. And it did. When we went on with our provincial tour (Nueva Ecija & Zambales) a week ago, I gave the last two cookies to my kumare. But since she got pregnant, her milk supply slowly decreased. Thus, giving it to her sister who still breastfeeds her 18-month-old son. I haven't heard anything from the sister if it helped with her milk supply or not. But as for me, the taste of the cookie is good. You can actually enjoy it even if you're not a breastfeeding mom. Except for its texture, it's a bit hard to bite but nothing like you can't chew it. It's still delectable. 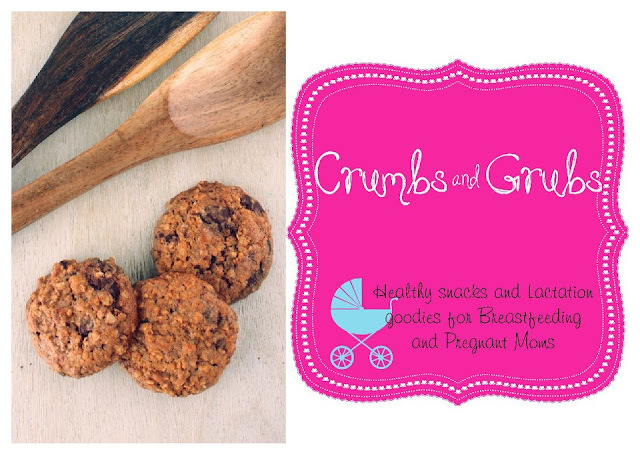 So if I'll get to have another baby (I'm sure God will grant the desires of my heart), I will sure try Crumbs & Grubs' lactation cookies for a smooth breastfeeding journey. Like Crumbs & Grubs on Facebook. Follow Crazy Bakes on Twitter. Oh wow, I didn't know there was another brand selling lactation cookies. YAY for the desire to help nursing moms!!! This is a nice treat for Mommies with babies! This is great, a cookie for lactating mom.Perfect for snacking. I'll bookmark your post so when the time comes that I'll be pregnant again I can consider this as my snack. I never heard about this lactation cookies but its good and helpful to moms. Lactation cookies are quite new to me. Mommies who need it might find this helpful. It was first time to be heard about lactation cookies.Moms should try this cookies,this sound so interesting. wish i had one of these after my second baby. i ahd a hard time lactating. walang lumalabas. i had to give up breastfeeding kase wala talaga. i wish i read about this post when i gave birth to my son, i could use a box or two of this! breastfeeding was my Achilles' heels + did not help that my little man did not want to latch onto my breast. i was not able to generate enough milk for him, so he ended up formula-fed...it was one my biggest regret, really, but am slowly coming to terms with it, especially in knowing that my son, who's 3 now, is growing to be active + healthy. wow really! that is a great product i wonder how they made this one? i wonder whats the ingredients of this cookie? good to know that it work.